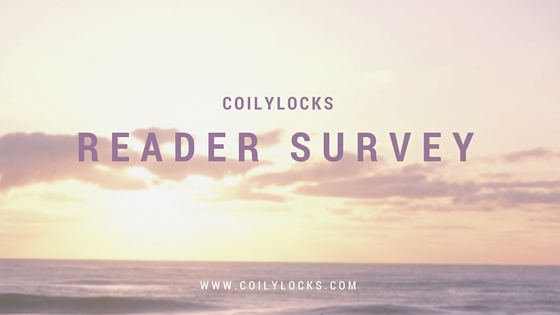 You are here: Home / Beauty / Coilylocks Reader Survey – Help a Sista Out! A few years ago I learned that people could actually make money doing this. And with that comes people selling you pipe dreams or giving you misinformation. I’ve made a lot of mistakes with my blog and I’ve also grown a lot as well. I started off just talking about natural hair and the journey that my teenager and I were going on together to have healthy hair. While working on my blog I met other bloggers and influencers that discussed health/fitness, nail art, motherhood and then WINE! I think by now you all know how much I love wine…LOL! But also along the way I started to lose my voice and my passion for what I wanted to talk about. It started to become more like “work” and less of me. When my daughter started to develop vitiligo last year my passion for writing was reignited again and I found a new voice. But did I also lose some of my readers when I started to get so broad with my topics?